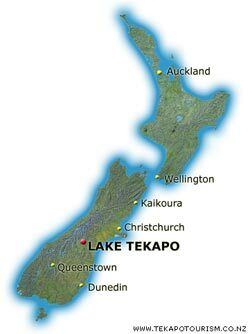 Finding and travelling to Lake Tekapo, including Tekapo maps with Tekapo Tourism - The online tourist and visitor guide to Lake Tekapo and the Mackenzie. Lake Tekapo is nestled in the heart of New Zealand's South Island. The lake lies at the foot of the Southern Alps, which rise to a height of 3 kilometres. New Zealand's highest mountain, Mt Cook (Aoraki) is a short drive away and rises to 3,753m (12,313ft). State Highway 8 runs through the township and makes Lake Tekapo one of the essential stops on the traveller's route through the centre of the South Island. From Christchurch, drive south on Highway 1. Turn off at Geraldine and follow Provincial Highway 79 through to Fairlie. Turn right on to Highway 8 at Fairlie and carry on to Lake Tekapo. From Queenstown, drive north along Highway 6 to Cromwall. Take by-pass highway 8a past the Cromwell township, across Lake Dunstan to Highway 8. Turn left on to Highway 8 and follow it through the Lindis Pass and in to the Mackenzie Basin. Continue on Highway 8 through Omarama to Lake Tekapo. From Timaru, drive inland on Highway 8 through Pleasant Point, Cave and Fairlie. Continue along Highway 8 to Lake Tekapo. 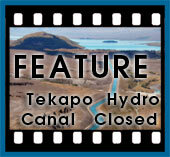 There are no scheduled air or rail links to Lake Tekapo and so transport is limited to road only. The closest international airport is in Christchurch, approximately 3 hours away. A charter flight service is available with Tekapo's Air Safaris and can operate from most major airports in the South Island and southern North Island.